Recently I wrote a series of posts about Sauvignon Blanc (click here), calling it the "greatest grape." Of course, there is not one grape variety that is the greatest- there are several and Sauvignon Blanc is one of my favorites, if not my single favorite. I did mention Riesling in the first post, noting that there are some important wine writers who label that variety as the world's most accomplished. I love Riesling, but don't get the opportunity to taste as many as I'd like, so I decided it was time to reacquaint myself with the grape. I've tasted a couple dozen wines made from Riesling over the past several weeks and starting with this post, I'll report about these wines. One of the reasons I labeled Sauvignon Blanc as the greatest grape was the fact that there are few varieties that display such brilliance in so many regions, be it the Loire Valley from France, Marlborough Valley from New Zealand, San Antonio Valley from Chile as well as a few zones in Washington State, California, Italy and a few others. Given that, Riesling deserves acclaim as well for its performance in so many wine zones around the world, from Germany and Austria to Alsace, Australia, New Zealand as well as California and Washington State. So let's start with Germany, the cradle of Riesling. 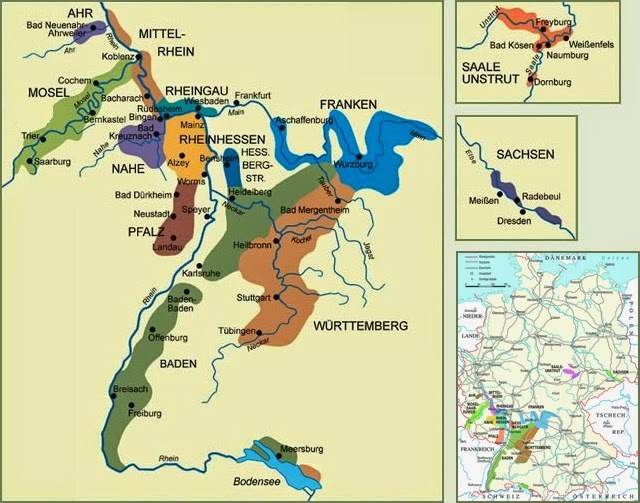 There are several major production zones with two most famous being the Mosel and the Rheingau. These zones are in southwestern Germany, with the Mosel - aka Mosel-Saar-Ruwer for the three rivers that define this area - further west. Both zones are imbued with stunning hillside slopes, the better to catch the sun at this far northern latitude. Generally speaking, the Rieslings from the Mosel tend to be lighter in the mouth than those from the Rhiengau, as wines from this latter zone are generally more lush with apricot and peach flavors. The Mosel Rieslings are often more mineral driven and though not as fat as those from the Rheingau, do offer amazing structure and tremendous cellaring potential. 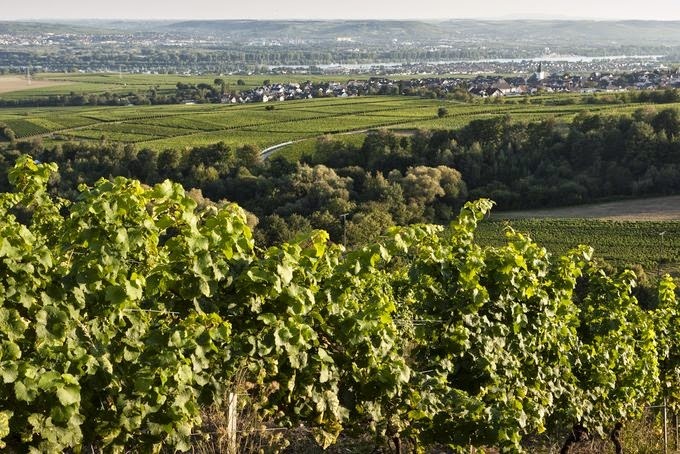 German Rieslings, no matter the origin, are known for their long aging ability, even for the less sweet versions (Kabinett, Trocken), which can still drink well at 7-10 years of age. Then you have wines such as Auslese and sweeter (Beerenauslese, Trockenbeerenauslese) that can drink well for 20-40 years in some instances. But even for the basic German Rieslings not meant for the long haul, there is a purity of flavor as well as vibrant acidity that defines these wines. It is no wonder then that producers all over the world use Germany as the goal they have in mind when producing their own versions of Riesling. 2010 Villa Huesgen Kabinett "Feinherb" (Mosel) - Aromas of yellow pear, magnolia and yellow peach. Medium-bodied, this has good varietal character, and is nicely balanced with good acidity. Pleasant and dry, with very good persistence and delicious apricot flavors in the finish. Enjoy over the next 1-2 years. ($38) - Imported by Qunitessential, Napa Ca. 2011 Selbach-Oster Riesling Kabinett (Mosel) - Straw/light yellow; pretty aromas of lime, white peach and lilacs. Medium-bodied with very good concentration. Juicy, lush fruit, good acidity and persistence. Clean with excellent varietal focus. Straightforward, this is a nice exmple of the Mosel style of Riesling; enjoy over the next 2-3 years. ($23) - A Michael Skurnik Selection, Syosset, NY. 2012 Weingut Spreitzer Oestricher Lenchen Kabinett (Rheingau) - Brilliant light yellow with pale green/gold reflections; lovely aromas of white peach, lilacs and chamomile. Medium-full with very good concentration. This is beautifully balanced with lovely vareital purity. The fruit is perfectly ripe with a light juiciness and there is very good cleansing acidity. The finish is dry with very good persistence; this is a delicious wine. Enjoy now and over the next 3-5 years – perhaps longer. At a suggested retail price of $21, this is an excellent value! - Michael Skurnik Selections. 2009 Prinz Von Hessen Riesling Kabinett (Rheingau) - Light yellow; beautiful varietal aromas of yellow peach, Anjou pear and lilacs. Medium-bodied with good persistence, very good acidity and impressive varietal purity. A charming wine that is delicious and easy to drink, this has a delicacy and a nice sense of finesse and freshness to it. Enjoy over the next 2-3 years – perhaps longer. ($25) Imported by Folio, Napa, CA. 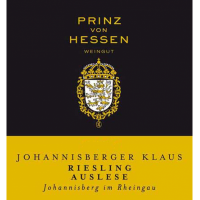 2006 Prinz Von Hessen Johannisberger Klaus Riesling Auslese (Rheingau) - Pale yellow – lovely color; aromas of apricot and geranium. Medium-full with excellent concentration, beautifully defined mid-palate. Vibrant, cleansing acidity and excellent persistence. Ultra clean with beautiful varietal character. Delicious now; enjoy over the next 7-10 years. Outstanding! ($50/375 ml). In part two of this series, a look at Rieslings from Alsace and Austria.